The Hotel Reina Isabel live a wonderful and enjoyable experience, allowing you to experience the relaxation for its friendly relaxed atmosphere. 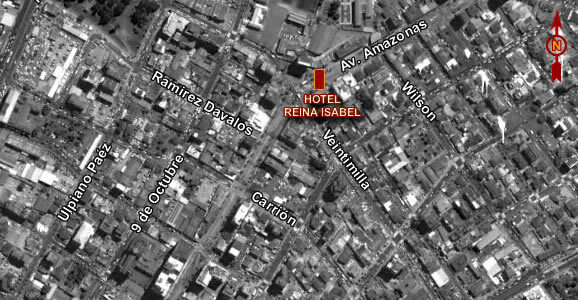 Situated on one of the main avenues of Quito, a few minutes from the Plaza Foch, 15 minutes from Mariscal Sucre Airport. The hotel with its comfortable and modern rooms offer great comfort and a great number of amenities in addition to its fully equipped rooms and excellent staff to help you organize your event whether business or social. The 56 rooms and 14 suites at the Reina Isabel Hotel are tastefully decorated, ensuring a comfortable stay for business or pleasure, with a spectacular view of the city in a cozy, quiet and safe. All rooms are equipped with TV 27 "cable TV, AM / FM radio, heating, hair dryer, makeup mirror and telephone especially in the bathroom.